A panel of Prince George's County officials have selected Optotraffic, a division of Lanham Based Sigma Space Corporation, as the vendor for its speed camera program. The decision to select the local vendor comes despite reports of errors by Optotraffic's cameras, as well as other issues such as drivers being denied court hearings. We've previously reported how these errors have been independently reported in the mainstream press in Forest Heights and Brentwood, and that some citations have been shot down in court on the basis of accuracy. We've pointed out that several citizens in the town of Cheverly completely independently raised accuracy issues about that town's cameras, confronting the town council in a public hearing (Cheverly's response to the complaints was later plagiarized by Forest Heights). Citizens have independently written to the Gazette about the errors. We've also reported on such errors in College Park and New Carrolton, and have received other reports of errors from Berwynn Heights and Riverdale Park. The errors were reported by a significant number of individuals independently of each other. Under the contract, Optotraffic would provide the cameras for use at up to 113 sites, including areas that are being newly designated as school zones solely for the purpose of deploying speed cameras. 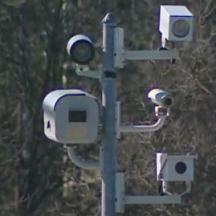 The county claims to have investigated, and rejected, the concerns about this type of camera. "When that was publicized, we stopped what we were doing and we checked into those claims," the Washington Times quoted county police Maj. Robert Liberati. "Optotraffic was chosen based on their history and their equipment most matching what the county wanted to do." StopBigBrotherMD.org wrote to the county executive's office and members of the council on July 14th with specific technical information regarding Optotraffic cameras. We humbly submit that StopBigBrotherMD.org has done more research into this particular type of camera than any other organization which does not profit from the cameras (and probably more than those which do profit from them). No response from any county officials was received, indicating that county officials are in fact not genuinely interested in seriously evaluating the evidence of errors and other issues. At the county's July 12th hearing two citizens spoke out about camera errors. In addition. Response from police speaking on behalf of Optotraffic run municipal camera programs was that there is 'no relationship' between timestamps on citations used to prove errors and the actual time between frames. Another citizen who spoke against the cameras pointed out that his evidence was based on an electronically recorded vehicle speed, not photo evidence. None of these specific cases of errors was addressed by the camera supporters at the hearing. AAA also expressed concerns about the cameras. "I don't think they know of the problems and complaints we've received (from members) about this company (Optotraffic)," AAA spokesman John Townsend said. "I don't trust their technology and we at AAA don't think it's the most reliable system out there." Rather than get into that again, let's look at this another way. Suppose we assume, for arguments sake only, that Optotraffic is correct, and that WITH THEIR CAMERAS, verifying the speed measurements from citation images is not possible. What would that mean? First, we'd need to ignore the fact that some of the error claims were NOT based on such images, particularly two such claims in College Park and New Carrolton. And of course the claims in Brentwood and at least one of the claims in Forest Heights was based on the driver's belief that the recorded speed was physically impossible. So for this argument we'll follow Optotraffic and PG County official's lead: problem ignored. Next you need to ignore Optotraffic's own claim in their own technical document which states "While the primary evidence for issuing a speeding citation is the calibrated Lane Sensor, the two photos provide the secondary evidence of speeding that is presented to the citation recipient. "(pg 4) and "Since a stationary object is present along with the vehicle, a photographic method also determines speed, guaranteeing fairness"(pg 2, last paragraph). We'll need to ignore Optotraffic's flip-flopping as well. a fraction of a mph with absolute reliability under all conditions. This seems to stretch credibility. We'll ignore that too. So ignoring all of this and accepting Optotraffic's claims there is still a problem: If it is not possible for ticket recipients to verify speed from citations, it is not possible for POLICE to do so either. For all the faults of Maryland State law, lawmakers did at least put one provision into the law designed to offer some protection to drivers. Citations must include two timestamped image showing the same stationary object, and that a police officer must sign a statement that he inspected and approved the tickets. In fact it is written right on Optotraffic's citations "I am an agent or employee of the City of _____. Based on inspection of the recorded images shown above, the motor vehicle was operated in violation of TA 21-809, as evidenced by the above images. Sworn to or affirmed by : _____"
But wait... how can anyone swear "based on recorded images" that someone was speeding, if verifying their speed from photos is not possible? It would seem this sworn statement could not be true. No meaningful review of citations by police would be possible since there would be no way to retroactively verify speed, even just as a 'sanity check'. In many cases with other types of cameras there are lines or 'tickmarks' on the road, intended to show where the vehicle SHOULD be in each frame if it was in fact speeding. But if Optotraffic's claims are true, this type of verification would not be possible with their cameras because the vehicles might appear anywhere in the frame regardless of how fast it is going. Optotraffic's cameras would be an inferior product to cameras which DO allow such verification... at least if a government actually cares whether innocent people might get cited and values having some kind of verifiability. Indeed, if timestamps really are not predictable at all, then how would they even know that 'target identification' would not occur, and that they would not cite the wrong vehicle by mistake? If they wanted to allow verification of targets, or to know that the recorded speed was actually the vehicle's speed rather than a random 'glitch', they'd want to ensure the vehicle was in a predictable location in at least one of the images to check that the vehicle being tagged was in fact the source of the speed measurement. But if the timestamp was off by say more than 1/2 second, you could have a situation where another vehicle had moved into frame behind the speeding vehicle, or worse yet that the speeding vehicle was approaching a slower vehicle from behind but had not yet moved into frame, and either way the wrong vehicle was cited. How could they know this would not happen if timestamps are really 'random'? Now, likewise we'll ignore that there are other issues besides accuracy. This includes the fact that Optotraffic, which for reasons that continue to confuse us is responsible for scheduling court hearings, has been denying court hearings to some drivers fighting Forest Heights camera tickets for up to a year or more. Indeed Optotraffic was offered hearing dates by the district court, yet certain individuals who have been waiting since September of May of 2010 were passed over for those hearing dates. Why can a private company, paid based on the number of paid citations, decide who can get a court hearing and who does not? It would seem that regardless of whether the errors are real, the drivers are still entitled to due process and the right to speedy trial, not to have Optotraffic delay court hearings. Not that there are any reason Optotraffic might WANT to do that, such as preventing embarrassing information from being presented in court until after they have secured a lucrative county contract. Nope, we can't think of any reasons they'd want that. Lastly, consider what Optotraffic's position really means in terms of the core principals of our justice system: that the accused is to be presumed guilty and cannot challenge the accuracy of the device by any means regardless of what the evidence shows. In Optotraffic's world, the ONLY evidence of the vehicle's speed is whatever THEY say the vehicle was traveling, even if the recorded images and ANY other evidence shows otherwise. Now the accusation itself is considered absolute proof of guilt. If the defendant is not actually allowed to assert their innocence and be judged based on the evidence why bother allowing court hearings at all if they are only a farce?!? It would be more honest to simply inform the public that they are now serfs who must now submit to any fine imposed by any local government and camera company, regardless of whether the accusation is true or not. Optotraffic and the governments using their systems would like you to disregard what we've been telling you, to accept their word on blind faith, saying that camera opponents have an agenda or something. The fact is Optotraffic and the municipalities that use their cameras are making TONS of money off these devices, and PG County hopes to do the same. StopBigBrotherMD, of course, doesn't make a dime off of this issue. Who has the conflict of interest? We say follow the money.